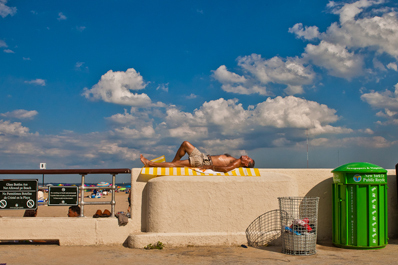 With Rockwellian clarity, Eliud Martinez re-imagines New York Puerto Ricans at the beach. Intimate portraits and landscapes, populated by subjects posing or captured in the act, reveal a keen eye for the uncanny in the ordinary, for beauty in the everyday. Martinez set out to document part of his community's experience in the U.S. and, in the process, transcended the journalistic form. There is an illustrative quality to many of his digital photographs that verges on the cartoon in certain instances and on caricature at times. Over sixty images offer an insider's view of a people at play and at rest. Whether they are sunbathing on the boardwalk, swirling in dance, or fronting a boom box, Martinez transports them and the viewer to a terrain that is familiar, yet unknown. 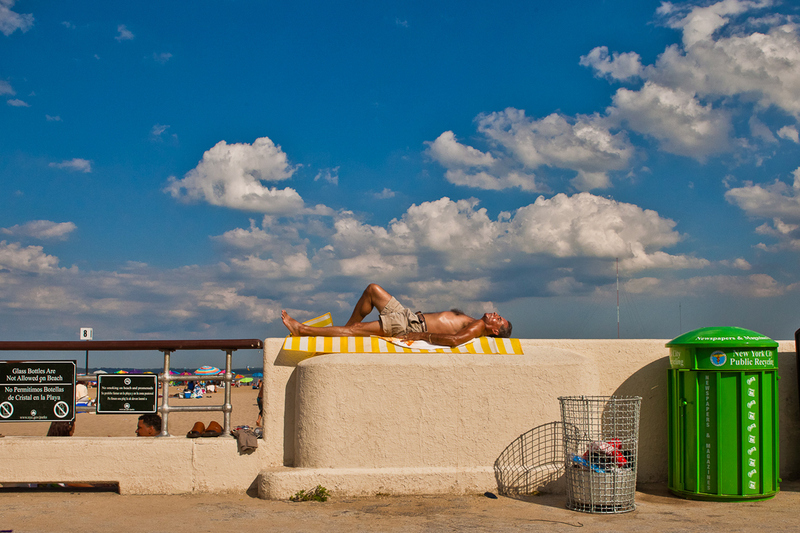 For the photographer "These images of summer revisit a favorite adolescent haunt of mine. A place that looms large in my memory, imagination and heart; where childhood friends and families continue to connect though they may no longer live in the same neighborhoods. They affirm a sense of community and celebratory joy in being with one another." Eliud Martinez is a Puerto Rican-born; New York City-based photographer and writer. He is a graduate of New York University, Columbia University and The City College of New York with postgraduate degrees in Social Work and Education. Martinez works in the documentary genre, pursuing themes of social justice and cultural equity. In 2012 his work was featured in the South Street Seaport Museum (NYC), as part of the Museum of the City of New York's show on Occupy Wall Street. He has also exhibited in other group shows, including the Salmagundi Gallery and MediaNoche, the Compton-Goethals Art Gallery at The City College of New York, and the Arts and Literature Laboratory Gallery in New Haven, Connecticut. His images have appeared in print and electronic media, including En Foco/Nueva Luz Magazine, New York Daily News, New York Post, CBS-TV, and CUNY-TV.